Although topaz ranks at an 8 on the Mohs scale of mineral hardness, it does require a lot of special care and regular upkeep to bring out its optimum brilliance and protect it from scratching other stones. It can also be easily severed with just one single blow – a quality also present in diamonds. 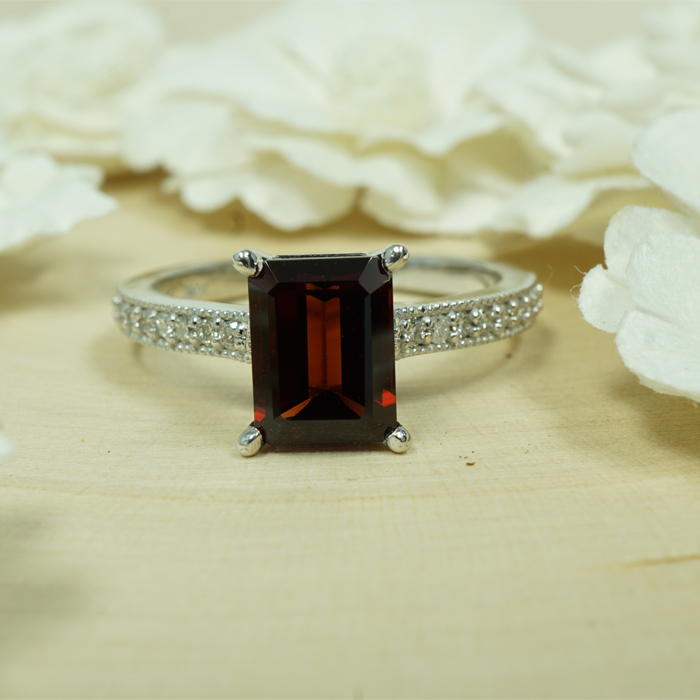 But with proper maintenance, this gemstone is one that is sure to last for many generations. Regardless of what type of gemstone you own, it is always recommended that your jewelry be handled by its band or chain, and never by the actual stone itself. This prevents the gem from accumulating buildup of natural oils and other residue. Start by brushing off the ring or stone with a 100% cotton cloth before applying any water, so as to loosen up any caked-on residue or oils. Pour lukewarm water into a bowl or sink. While the water pours into the container, mix in a teaspoon of mild liquid soap. Do not use any harsh or abrasive detergents/cleaners, as these could damage the color of the stone. If needed, place a towel or other protective material to the bottom of the sink to prevent any damage from the stone to the bowl. Allow the gem soak for about 20 minutes to allow dirt and oils to loosen. Apply a soft-bristled makeup or jewelry brush to clean the stone’s surfaces. If there are multiple stones in one piece of jewelry, be sure to clean in each of the crevices and along the prong areas, so as to not miss any dirt particles. Rinse the stone with lukewarm water only. Do not use hot water. Repeat rinsing if necessary to ensure all soap and residue is removed. Dab the stone dry using a soft, 100% cotton towel. If possible, avoid using your fingernails to get in each crevice. Use a piece of ultra-soft cloth to wrap the gem, and place it in a safe, room-temperature area to dry to its entirety. The stone should be completely dry to wear. You should also visit a certified jeweler once or twice per year to have your gem thoroughly inspected and professionally polished. In doing so, you will ensure an even more intense brilliance in your topaz. The jeweler can also examine the stone’s mounting and setting for accidental repositioning, as well. Topaz is a rather durable stone in terms of mineral hardness. Because of this, it’s important to properly store your gem, both from damaging other less-hard gems (like talc) and harder gems (like diamond). A good way of doing so is to compartmentalize each stone in individual boxes at room temperature. Should your topaz become scratched or cracked, it is recommended that you take your stone to a professional for fixing, as it is one of the harder minerals. Without proper knowledge of how to mend this gemstone, you may end up damaging other tools or materials in the process, or further damage the stone itself.